The Nord Drum 3P combines the brain and pads of previous models into a powerful percussive package. I’ve been a huge fan of the Nord Drum range since its introduction in 2012. While I think it would be true to say that the diversion from the path of the keyboard into drum and percussion products was fairly unexpected, Clavia do have their origins in the Ddrum, back in the early to mid 1980s. And, as you might expect from a company who have been responsible for some of the most innovative synth products around, they’re not in the business of producing a ‘me too’ drum device. The Nord Drum has always been a little bit different, offering something you won’t find in other drum or percussion products. In fact, the clue is very much in the name: the Nord Drum 3P Modelling Percussion Synthesizer. I’ve been lucky enough to review both the Nord Drum [SOS August 2012] and the Nord Drum 2 [SOS May 2014]. The latter introduced some significant changes and enhancements to the original unit, in terms of both functionality and playability. While retaining the drum module or ‘brain’ format, the Nord Drum 2 included trigger inputs to allow you to play the sounds from external sources such as drum pads. 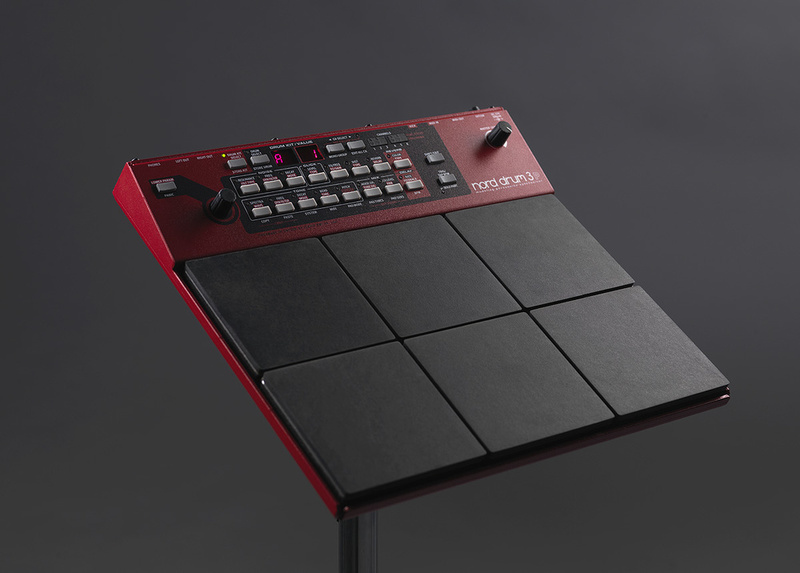 Clavia also introduced their own pad set — The Nord Pad — that connected to the Nord Drum 2 via a dedicated Ethernet-style cable and further enhanced the live playability of the unit. The most recent incarnation, the Nord Drum 3P, brings together the Nord Drum ‘brain’ and the Nord Pad into one integrated unit, creating an all-in-one solution that promises to be impressive. The ND3P retains much of the now-familiar look of its predecessors. It is still, however, quite a diminutive unit compared to other similarly styled Roland or Yamaha products. It is extraordinarily thin and weighs in at a fraction over 4lbs. Having said that — and like all Nord products — it feels very well built, with a solid metal casing that has an almost industrial feel. The larger form factor necessitated by the integrated pads has allowed more parameters to have their own dedicated buttons rather than being accessed via a Shift or Row Select feature, which streamlines the operation of the unit. The LED display, meanwhile, although it is the same size as that of the Nord Drum 2, is split more obviously into two halves, and lends itself to the simplified drum sound selection I’ll address later. It’s still a six-channel unit, but a visual face-lift has updated the channel indicator LEDs, which are now illuminating triangles, and all the buttons are now a uniform grey with a rubberised feel. The rear panel of the ND3P also reveals a few changes since the Nord Drum 2: the six trigger input jacks have been replaced by a single ‘Kick’ trigger input and (as you might expect, given the integration of the six pads into this model) there is no connection for the Nord Pad. One addition to the rear panel is a small on/off switch, not present on either of the previous units. Everything else remains the same: quarter-inch left and right main outputs, mini-jack headphone output and, of course, MIDI In and Out. 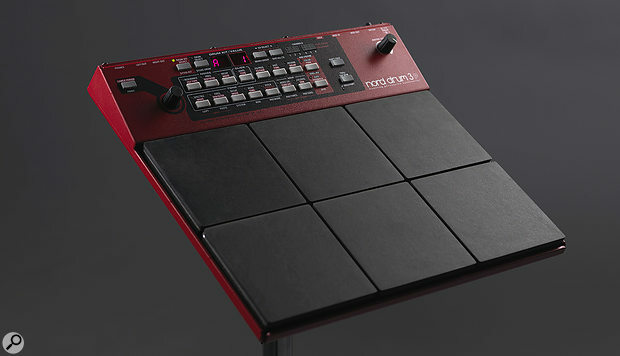 The integrated pads are identical to the Nord Pad previously available as an accessory to the Nord Drum 2. They have a surprisingly basic look and feel but do the job exceptionally well, with no crosstalk and a nice solid feel. Each pad, plus the kick trigger, has its own dynamic response curve, threshold level and sensitivity. It is possible to set the pads to be played with sticks or hands, although in practice I didn’t find a big difference between the two settings. For me, sticks are the preferred playing method. The Kick input triggers channel 1, which is typically assigned to a kick sound in the majority of the preset kits. As the ND3P no longer includes the six trigger inputs of the Nord Drum 2, the Kick input is a great addition to the integrated pads and very handy for playing in a ‘normal’ drummer fashion with two hands and foot! Although it’s labelled ‘Kick’, you could, of course, attach any external trigger to this input to expand and enhance the capabilities of the ND3P in a live scenario. In addition to the Kick trigger it might have been nice to include a hi-hat control pedal input to switch easily between open and closed hi-hat sounds and possibly trigger a foot-closed sound. Bearing in mind the integrated, all-in-one nature of the ND3P, this would certainly have enhanced its obvious leaning to live performance. On turning on the ND3P, users find themselves in ‘Kit Mode’. The left portion of the LED display denotes the bank (A-H) and the right half the kit number (1-50) within that bank. The first four banks are filled with the ND3P Preset kits. Banks A and B are dedicated to more traditional (in the broadest possible sense!) kit configurations, usually constituted on some kind of kick, snare and hi-hat basis, with additional percussion occupying the remaining three voices. It’s very difficult to describe the presets of the ND3P, which I appreciate isn’t ideal in a review! The problem is that they really are unique. There are, of course, the fairly typical electronic drum sounds we are all used to hearing, but the vast majority of sounds are like nothing you will hear from any other drum module. Having said that, pretty much everything in the first two banks is very, very usable. Often the quest for uniqueness and originality can result in sounds and presets that just don’t fit in any track, but that isn’t the case with the ND3P, whose extraordinarily dynamic nature gives an almost acoustic quality to what are very much electronic sounds. Bank C is used for melodic and tuned percussion presets, with Bank D featuring the more esoteric kits and effects. While the presets here are certainly a little wilder than banks A and B, there are very few you’d not find useful or inspiring. Banks EH are blank, so in total they offer a further 200 locations to store your own creations (four banks of 50 kits each). While the method of selecting preset kits is much the same as with previous models, editing kits and creating new kits is where things change a little. Pressing the Drum Select button gives you access to nine preset drum banks: Bass Drum, Snare Drum, Toms, Hi-hats, Cymbals, Percussion, Bells, Tuned Percussion and Effects. You can now very quickly and easily create or edit an existing kit by calling up new sounds from these categories. You can replace a kit’s snare, for example, in seconds. There are 24 preset bass drums, 24 snares, 10 toms, 10 hi-hats, 10 cymbals, 18 percussion sounds, 10 bells, 10 tuned percussion sounds and five effects. All are editable and can be saved into one of eight User banks, each with 50 preset slots, so you can create and store 400 of your own drum sounds, which can be easily called up into any kit. The only slight drawback is that you can’t name the user locations, so you might need a spreadsheet to remember where you put that great snare drum you created! This ease of editing is further enhanced by the ‘Pad Follow’ option, which is enabled by pressing both of the Ch Select buttons together. With this option, whichever pad you hit becomes the pad you are currently editing. A feature like this becomes a lot more relevant now that the pads are integrated. With the Nord Drum 2, you had to make sure you had manually selected the correct channel before editing. I’ve certainly found myself playing one sound whilst unwittingly editing another! It’s worth a quick reminder here of the simple but useful Nord Drum 3 Manager program that enables you to transfer and back up drum banks to and from your Mac or PC via MIDI. Although it’s a very basic utility (there are no editing capabilities), it does make it possible to save, share and load in new banks of sounds to the ND3P. On the Nord Drum 3P’s rear panel we find a power socket and on/off switch, MIDI I/O ports, an input for a drum trigger, quarter-inch audio outputs and a 3.5mm headphone port. The ND3P’s sound architecture is essentially the same as previous models, with Noise, Click and Tone elements combining to produce each drum sound. If you are familiar with editing the Nord Drum 2 you will find that very little has changed, apart from some streamlining and consolidating of parameters. As I’ve covered the editing and sound creation methods of the Nord Drum in some depth in my previous reviews, I’ll focus on what is new or different and suggest you take a look at those reviews (which you can find in the August 2012 and May 2014 issues of SOS) if you’re new to the Nord Drum range. Tone: The Tone element could be described as the ‘meat’ or ‘body’ of the sound. This section includes a selection of synthesis models, referred to as Waves, which are divided into four categories; Resonant Synthesis, Subtractive Synthesis, Frequency Modulation and Ring Modulation. The Nord Drum 3P adds two T-Bridge oscillators and two ring mod oscillators to the previously available palette. Noise: The Noise element (essentially a white-noise generator followed by a dynamic filter) is where you can add bite and harshness to a sound. The parameters of this section have been streamlined a little to bring them in line with the layout of the Tone section, making editing between sections more consistent. This does mean we lose the Attack Rate and Attack Mode parameters, which is unfortunate, but in use I would be inclined to keep attack times of percussion sounds short anyway. Click: The Click element previously offered 36 different click options. This is now reduced to 12, which I don’t find a huge limitation and, again, it actually helps to simplify the editing process. The Nord Drum 2 introduced effects in the form of distortion, EQ and a basic Echo/Repeat feature. The 3P expands upon these with the addition of reverb and an enhanced delay effect, which is now a true audio-based delay rather than the ‘MIDI repeat’ function of the Nord Drum 2. The EQ and distortion can be applied independently to each channel, whereas reverb and delay are global effects that can then be applied to each voice as required. In terms of parameters, the Reverb Colour (the balance between low- and high-frequency content) and Reverb Type (tiled room, room, plate, stage and hall) can be adjusted, along with the rate and feedback of the delay effect. The Delay Rate (time between repeats) can be set between 10ms and 1.15 seconds, or as a bpm value. It’s also possible to set the delay rate via the tap-tempo button. Unfortunately, the delay doesn’t sync to MIDI Clock, so won’t be locked to any connected MIDI devices or DAWs. While we’re on the subject of MIDI, again the ND3P implementation is pretty much as it was on the ND2. Every parameter of the ND3P can be transmitted or received via MIDI, which allows for some great real-time performance tweaking to be recorded into your DAW or sequencer. Obviously, the integrated pads trigger the internal sounds of the ND3P and also transmit MIDI Note data, so you can record your performance or potentially trigger other sound sources. You have the option to set a Global MIDI channel, meaning that all notes and Controller information will be transmitted and received on this channel, or each Nord Drum channel can have its own MIDI channel, so each drum sound will be controlled independently. I thought the Nord Drum and Nord Drum 2 were exceptional and innovative products, and the ND3P certainly continues that tradition. This instrument really is a unique proposition. With integrated pads and easily accessible drum categories, the ND3P puts a foot into Roland and Yamaha territory, having some similarity to units such as the Roland SPD range, but that’s probably where the comparison ends. Although full of extremely usable presets, including some classic and recognisable voices, its sound-creation capabilities and dynamic control give it the appeal of the more esoteric Korg Wavedrum. At £579$699, it’s around the same price as the Roland SPD SX, SPD30, Yamaha DTX Multi 12 and Korg Wavedrum Global, and in a way offers a little piece of all of them. The Nord Drum 3P has a great ‘all in one’ feel, with instant gratification from the built-in pads. No need for external triggers, Nord Pad or a MIDI sequencer to start getting something creative from it. Having said that, the MIDI implementation means that the ND3P is equally at home as a ‘drum module’ in a studio environment or as a live performance tool. It almost goes without saying that, like all Nord products, its build quality is exceptionally high. The editing and sound creation has been made even easier with the introduction of the drum groups and the streamlining of some of the editing parameters, and the delay and reverb effects have added to what was already a stunning-sounding instrument. You’ll find yourself putting on a pair of headphones and vanishing into the world of the Nord Drum for hours! Easier editing and sound creation. Addition of reverb and delay. Delay doesn’t sync to MIDI Clock. Hi-hat control would be a useful addition. With the integration of drum pads, the Nord Drum 3P is a fantastic consolidation of all that has gone before. It balances perfectly between creating unique, almost other-wordly sounds on the one hand and remaining infinitely usable on the other.